There's another designer tag sale going on this Saturday with the fabulous Nathan Turner, online via One King's Lane. The sale starts April 10 and runs through April 13. 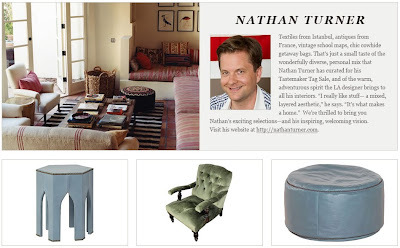 Nathan has impecible taste and a knack for mixing styles and eras and also includes amazing antique furnishings and textiles in his designs. Above is the exerpt from One Kings Lane. Register at One Kings Lane today to partake of the tag sale goodness.